This is, more or less, the number that will show up on your bill if you select the Acer Extensa 5230E configuration with the somewhat awkward label 901G16Mn. A very small price for a notebook, in view of the possibility to waiver on Windows Vista and to thus haggle the costs to under 300 Euros. But - how much notebook do you actually get for this low price? The Extensa 5230E model range aims at smaller and medium companies that need simple office notebooks that can also be used mobile. However, it could also be interesting for modest private users, too. The models represent the starters of Acer's Extensa range. Our prototype was quite meager in view of its configuration and has to come clear with very little connections. Windows Vista Home Premium had been installed, though; the notebook is also available with a Linpus Linux distribution that reduces the price by an additional 70 Euros. However, those who would like to work with the preinstalled Linux should consider that it has problems with a few internet sites and that there aren't drivers for all hardware devices available. A more established distribution such as openSuse or Ubuntu would have been much more customer-friendly. Those who already have a Windows full version at home can install it without problems. As already said, we didn't need to do this. Windows Vista Home Premium does its job on our Extensa. 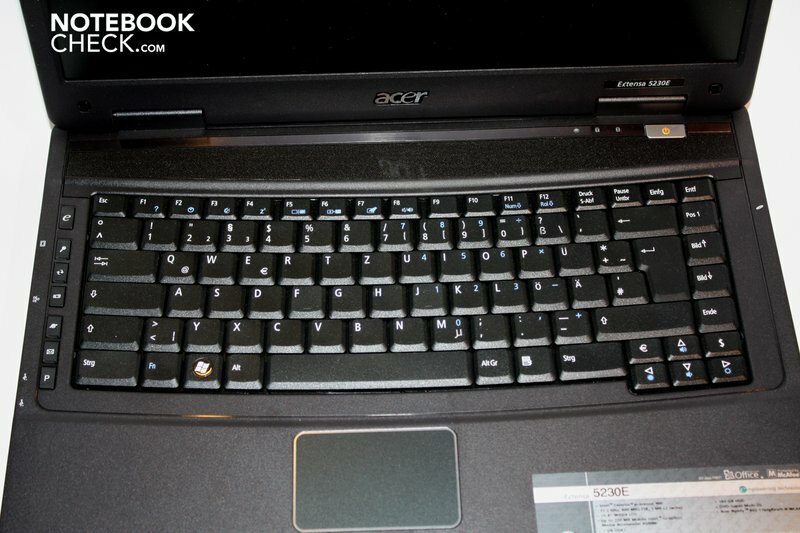 Acer has also built a somewhat higher clocked Intel Celeron M 900 into the prototype: The clock rate adds up to 2.2 GHz. 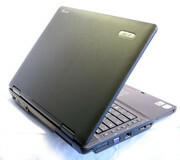 There are also models available with Celeron M 575 (2.0 GHz) and Celeron M585 with a 2.16 GHZ clock rate. The price differences are only marginal so that you can definitely take the one with the fastest processor. Of course, you mustn't expect an aluminum case or a glass touchpad for less than 400 Euros. The Extensa 5230E presents itself quite classical in black plastic. 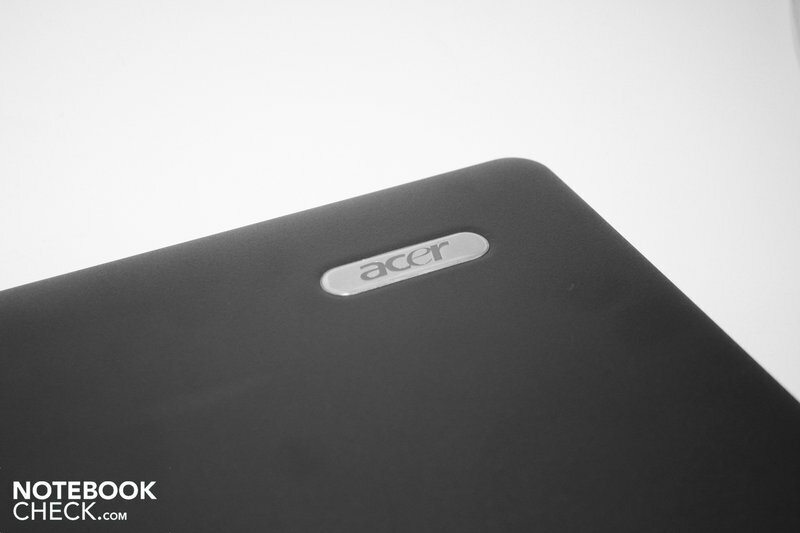 Agreeable: Acer doesn't use smudge susceptible high-gloss surfaces at all; the plastic is matt and slightly roughened. This material is used from the wrist-rest up to the display frame, merely the loudspeaker cover above the keyboard simulates a perforated metal part. 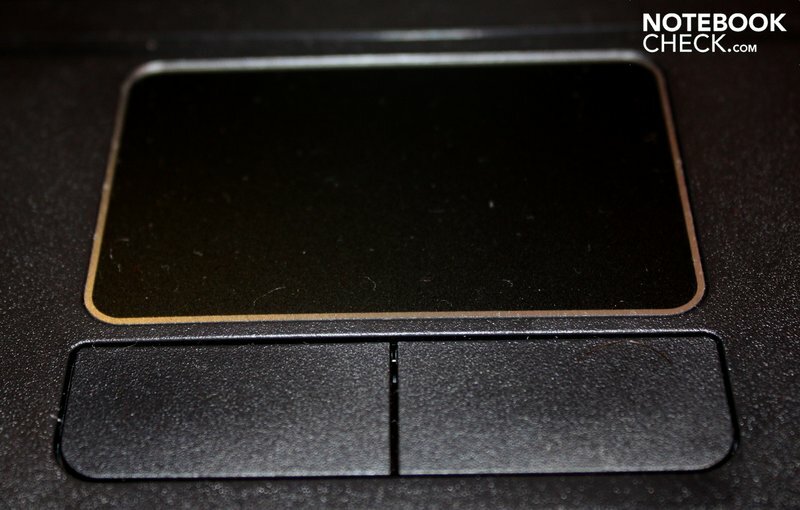 The power button and the touchpad bezel is also made of silver plastic. The case tray is manufactured of the same plastic, merely the plastic on the front, where the panel on which the audio outputs and the hardware switches for Bluetooth and WLAN have been placed, looks like brushed aluminum. With so much plastic, it's no wonder then that you get a whiff of plastic when you unpack the notebook for the first time. This was, however, very mild and we couldn't smell it anymore on the evening of our first test day. 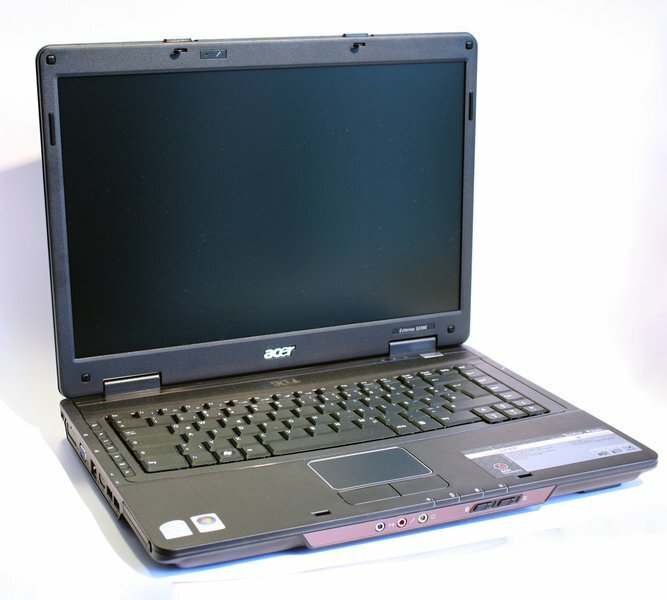 Acer spared on packaging wherever it was possible and delivers the notebook in a cardboard box with papier-mâché fillings, which are significantly more friendly for the environment than plastic and polystyrene fillings. All surfaces have a nice feel and also look well-matched. The keyboard is, as Sony has already done it, slightly submerged in comparison to the wrist rests and loudspeaker cover. Additionally, the keys are implemented in a slight curve from left to right, which is supposed to increase the ergonomics. You can read if this has been successful in the section about input devices. The workmanship obviously hasn't suffered under the price pressure: The notebook always feels compact and can also be picked up at one corner without creaking or yielding. The keyboard doesn't bend anywhere and the power button, as well as the hot keys left of the keyboard, are built tightly into the case. 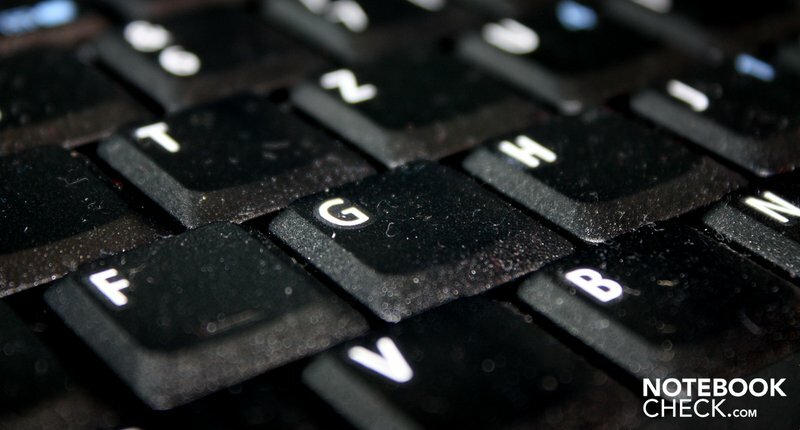 Talking about hot keys: Email program and web browser can be started with a push of a button, or a system backup can be created, the computer's accessibility locked or even the presentation mode can be called on, with which a projector can be accessed with only one push of a button. The monitor cover is also made of roughened plastic, just like the rest of the case, but is quite yielding and thus doesn't protect the screen much against pressure from the back. The display can also be twisted fairly intensely. The screen is kept in place by two broad hinges that do their job with the necessary tension so that the screen barely rebounds. Two metal hooks pull the display to the notebook in a closed state. They can be opened from the outside with two sliders, whereas it's sufficient to trigger one of the sliders to open the lid. Opening can also be executed single-handedly because the hinges don't show much resistance and the laptop is heavy enough. For example, on the front, beside the standard 3.5 mm headphone and microphone socket, there is a third socket for a jack plug. This is a line-in connection over which pre-amplified signals can be fed in easier than over the microphone-in. A rarity for notebooks. Beside this, there is also a hardware switch for the integrated WLAN module and Bluetooth on the front, which wasn't included in our model. Anyhow, our prototype rather presents which connections the user might have gotten for a larger investment: On the left there is, for instance, a plastic-covered punch-out for an HDMI-out under which "HDMI" is embossed on the plastic. A serial port would also be possible, which is also located on the left. 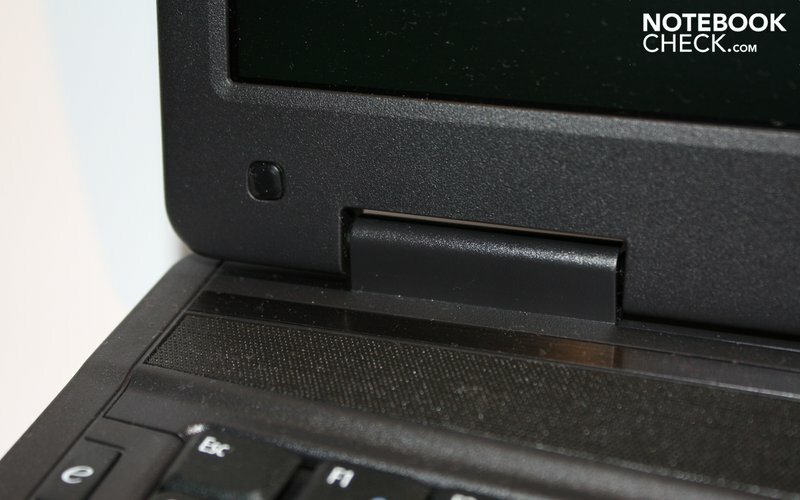 Apart from that, there are following interfaces on the left, from front to rear: A slot for PCMCIA cards, with which the notebook's connectivity can be improved, then two USB 2.0 ports, the LAN port and display out. 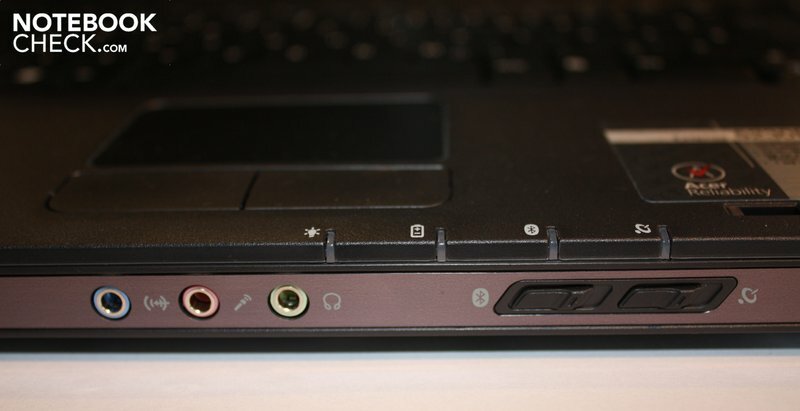 A Kensington lock for securing the laptop can be connected in the very back. The right is unfettered from any connections, merely the DVD burner is found here. For this, there is a further USB port on the rear, and the socket for the adapter. You will find a further plastic cover here, which hides the punch-out for a combined eSATA/USB 2.0 interface that can be built in here. 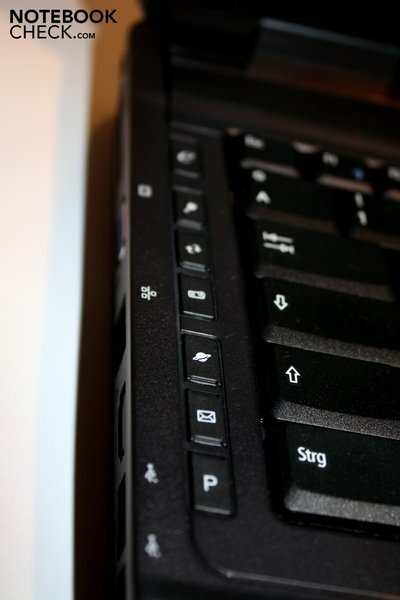 Practical: All side connections are marked on the upper side beside the keyboard so that you don't have to twist your neck to plug in an, for instance, USB device, but can already see from above where the single connections are. 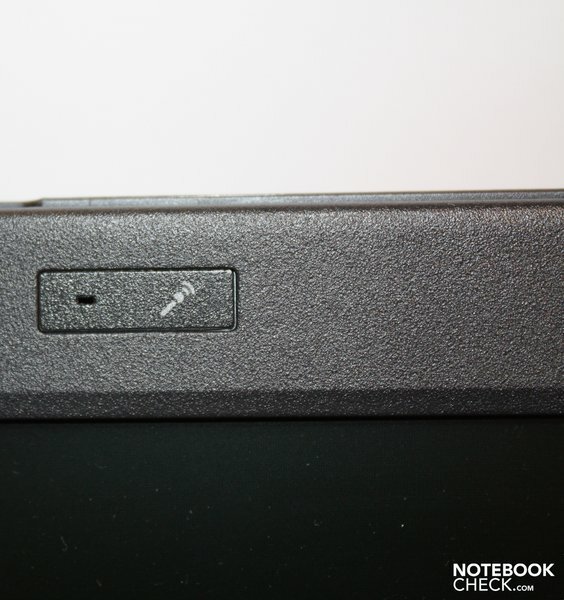 Acer builds in a microphone over the display. There wasn't a webcam integrated into our prototype. What we also missed was a cardreader. A few other models of the range already have it. It's then built in to an exchangeable front bezel. The 32 bit version of Windows Vista Home Premium was included in our prototype package. 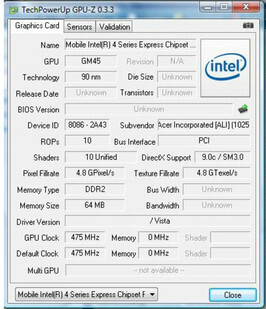 When this review is published, the device will also be available with Windows 7 Home Premium. Those who have an older model with Vista can upgrade to Windows 7 for a shipping flat rate of 14.90 Euros on the Acer Website and by Microsoft's official sales partners. As already said, the device is also available with a Linux distribution from Linpus, which is about 70 Euros less in the total price. This will please those who have an operating system at home or want to try out an alternative. 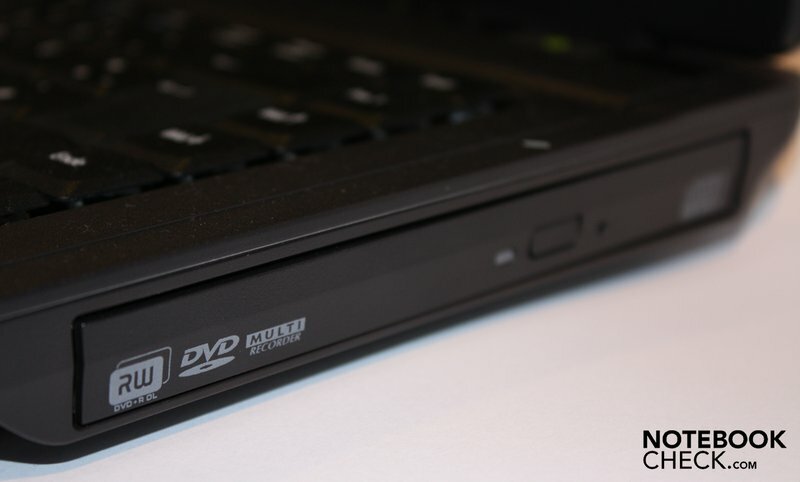 Acer includes InterVideo's WinDVD8 for relaxing with a DVD after a dreary work day. Those who prefer to create their own media can use the NTI Media Maker 8-Suite, which has an audio editor, a print studio for CD covers, a "media ripper", burning software and many more. With the programs Backup Now 5 and Shadow, from the same manufacturer, the system can be secured. Aside from that, there is the, almost mandatory in the meantime, trial version of Microsoft Office and McAfee Security Suite that has a virus scanner and internet protection. 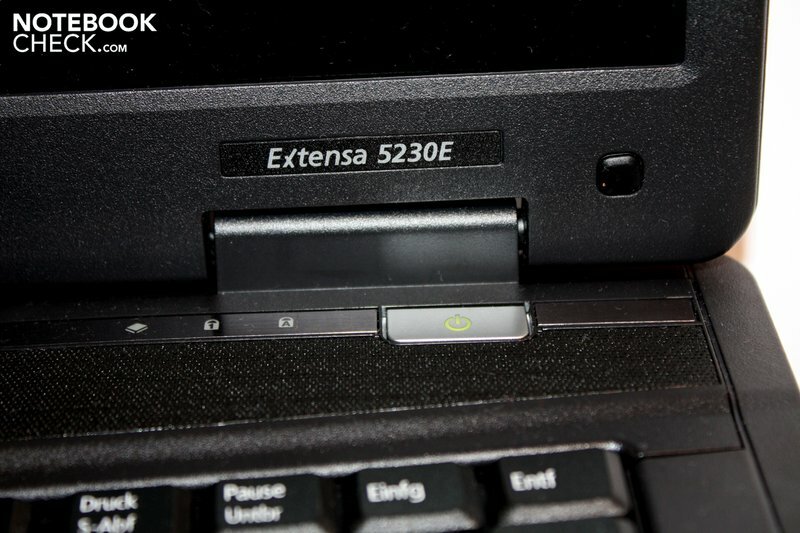 The first thing that strikes you when the Extensa 5320E is opened is the slightly curved keyboard that, so to say, obliges the hands. Actually, this form is very intuitive and you accommodate yourself quickly to the keyboard. Frequent and fast typists should also benefit from the slightly curved design. Unfortunately, the keyboard also has weak points: It sits tight in the case and doesn't deflect anywhere but the single keys are relatively loose and wobble back and forth now and again. Additionally, the pressure point isn't clearly defined so that the feedback for the key pressure turns out imprecise. There's no reason for complaint about the key layout: All keys are sufficiently large and are placed there where they belong. 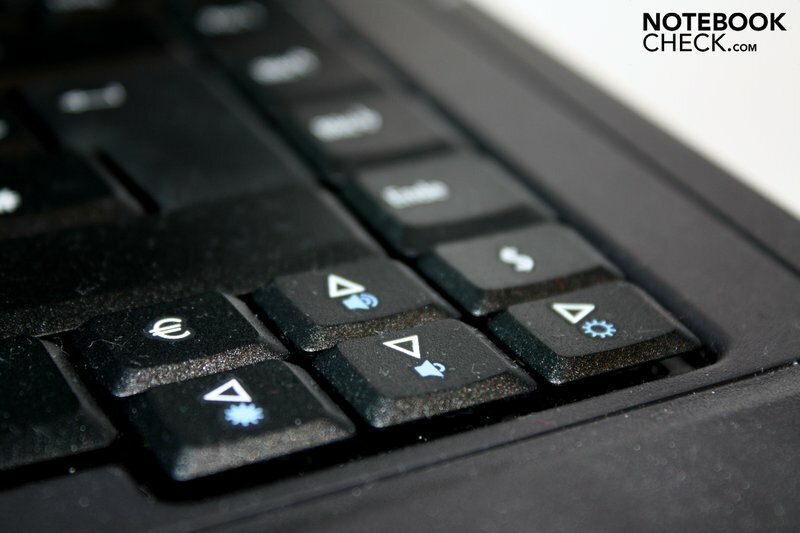 Volume and display brightness are controlled with the Fn-key in combination with the arrow keys; aside from that there are a few rather unusual, but quite practical key combinations: For instance, with Fn + F1 a help document about all hotkeys can be called up. 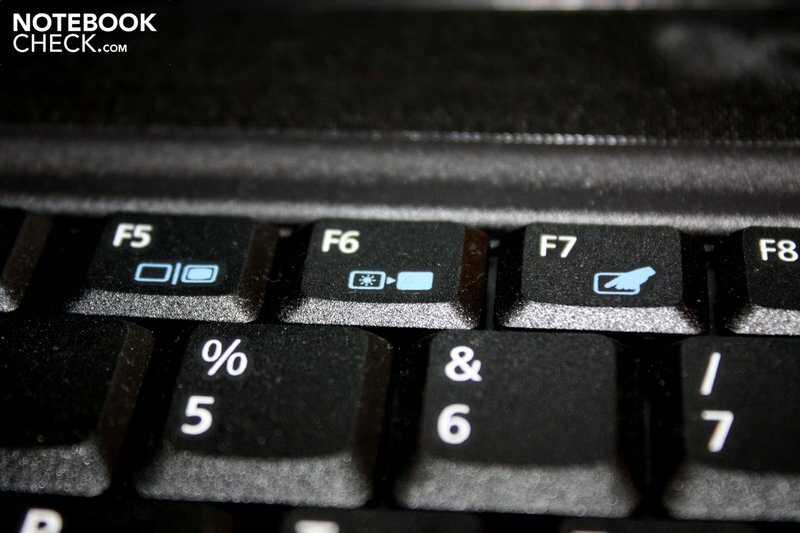 The display's back light can be turned off to save energy with Fn + F6. The touchpad is well separated from the wrist rests, as it is encased by a small, silver plastic frame on the one side and on the other has a smooth surface that contrasts well with the roughened wrist rests. The mouse cursor responds well to finger gestures and clicks by tipping the touchpad are also executed reliably. Almost unusual is that there isn't a scroll bar on the right edge, with which a mouse wheel can be replaced. But it's usually often triggered unintentionally anyway so that its omission can be coped with. 15.4 inch, 16:10, 1280 times 800 pixels, matt surface. So the key data of the TFT LCD display that Acer builds into the Extensa 5230E. The display is well suitable to work with, especially due to its matt surface, which reduces annoying reflections. Therefore, the display can be used even in a very bright surrounding without problems. The display's aspect ratio of 16:10 is also an advantage. Particularly, when longer documents are edited or web sites are looked at: The screen doesn't have as much height with the already common 16:9 aspect ratio and you have to scroll more frequently. However, you have to accept the fairly low resolution and the resulting less space for larger documents. 1280 x 800 pixels aren't really up-to-date anymore. The resolution is sufficient for average office work, though. The missing LED backlight is quite a bit more displeasing. 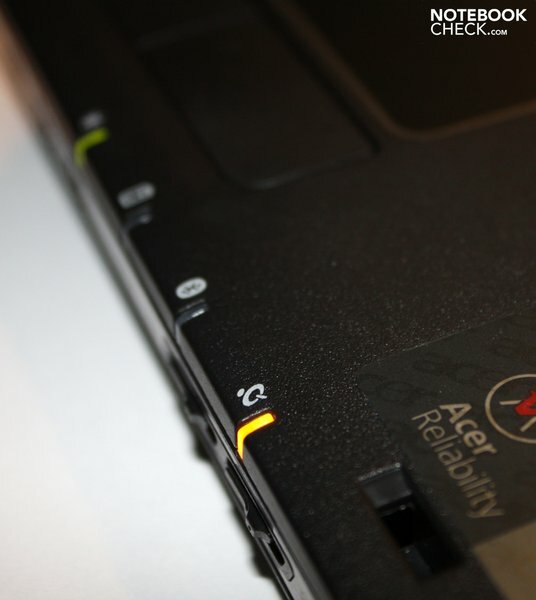 Acer uses common fluorescent tubes for the display's backlight. This has a higher power consumption and the illumination should turn out less homogenous than with the use of LEDs. And really: The display's darkest area is only 76.5% as bright as the brightest. This is still in the center field, but a graying of larger white areas is very distinct. The average brightness of 156.8 cd/m2 is equally not a really good value. By the way, the screen is brightness in the center with 161.8 cd/m2. We could also denote the contrast value of 165:1 with "sufficient". At least the horizontal and vertical viewing angles are okay; when sitting at the side of or a bit above the screen, you can still see what's happening on the screen. That colors aren't as brilliant as in a glare display is natural, but the color nuances on Acer's display make a very blurred impression and black is also more a dark gray. Acer definitely hasn't built in the screen for graphical applications and photo fans won't be very pleased about the not very impressive color representation and the uneven illumination, either. Because the notebook is aimed at another user category, which will principally use word processing and presentations, you probably have to make compromises on the display's quality, in particular in view of the price. That the Acer Extensa 5230E is barely suitable for graphic programs and other demanding applications can be seen at a look on the configuration: With a Celeron 900 with 2.2 GHz, an Intel GMA 4500M and a one GByte RAM, every kind of spreadsheet should be possible but you shouldn't expect too much more from the laptop. But the performance values of the Extensa 5230E aren't so bad after all: We tested HD video rendering with movie trailers from the internet first. There weren't any problems here, the video ran without studdering, sound and image were always synchronous. Of course, you shouldn't do too much adjacent to watching the video, as the small single-core processor isn't made for multitasking. The synthetical benchmarks led us to an overall rating of 69% for application performance. That is, if you consider the price again, a quite acceptable value. 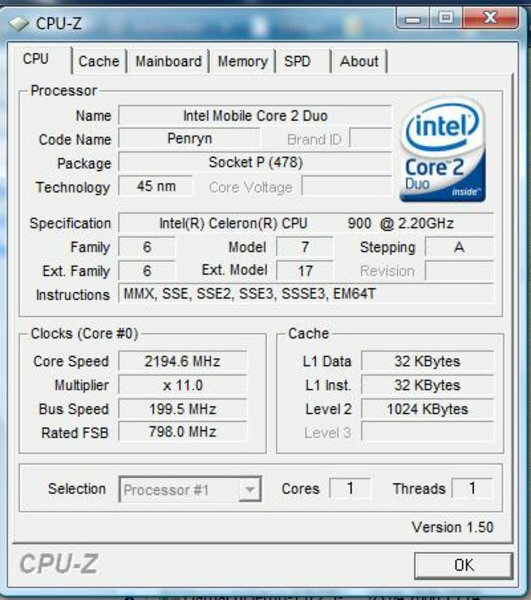 If you also consider the current trend to energy saving processors, a significantly higher application performance, like 2062 points in the Cinebench R10 or 2586 points in the PCMark05, is certified. Naturally, the verdict of gaming performance is devastating: 680 points in 3DMark05 and 52% in the overall rating rather indicate that no 3D game will be able to run smoothly on the Extensa 5230E. However, it should be sufficient for old classic games from the time of StarCraft or Baldur's Gate. 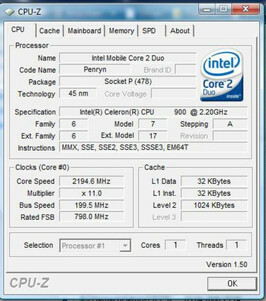 The one GByte DDR2 RAM comes from Samsung and clocks with 667 MHz. Only one of two RAM slots is occupied so that an upgrade to 2, 3 or more GBytes RAM is possible. However, you should consider the practical upper limit of 3GBytes due to the 32 bit operating system. If a 64 bit system is installed then more can be used. The hard disk comes from Western Digital, has the name Scorpio Blue and the model lable WD1600BEVT-22ZCT0. It rotates with 5400 revolutions per minute, can store 160 GBytes of data and has a 8MB cache. The values are solid and inconspicuous for a 5400 disk: The access rate turns out low with 17.5 milliseconds and the maximum data throughput of 64.5 MByte per second does, too. Both values are still within the standard. An HL-DT-ST DVDRAM GT30N from Hitachi LG Storage is employed as the DVD burner that reads and writes DVDs with an 8-fold velocity. We didn't have any problems with the drive at rendering. It recognized all of our DVDs without difficulty and worked fairly quiet, too. The WLAN card comes from Atheros and is called AR5B93. It's already capable of the new standard 802.11n for wireless networks and should therefore also be well-equipped for the future. 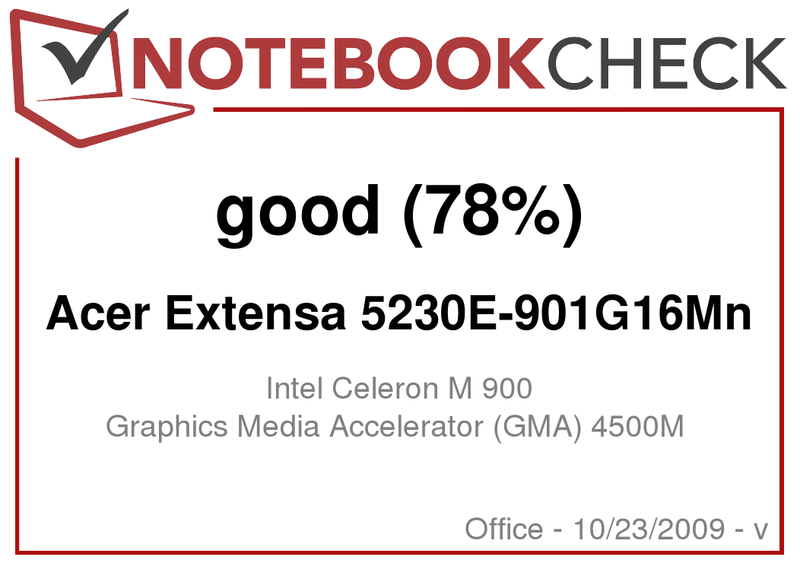 Finally, we also tested the Extensa 5230E's latencies. These could get noticeable when the driver doesn't work optimally with the device. The result would for instance be that sound interruptions are noticed at use with an external sound card. The Extensa 5230E allows itself a few slip-ups here. 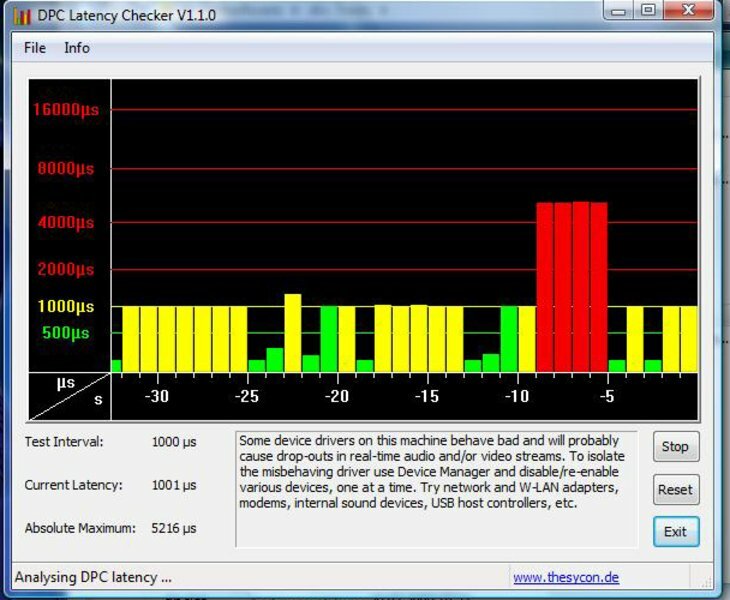 The DPC Latency Checker tool reached into the red area a few times so that problems with external devices can't be excluded. 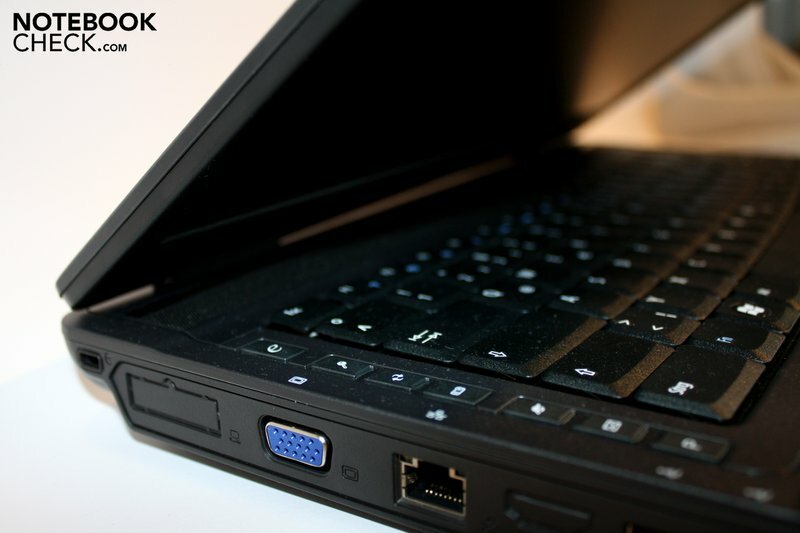 Generally, it can be said that the notebook bids a good performance for its low price. 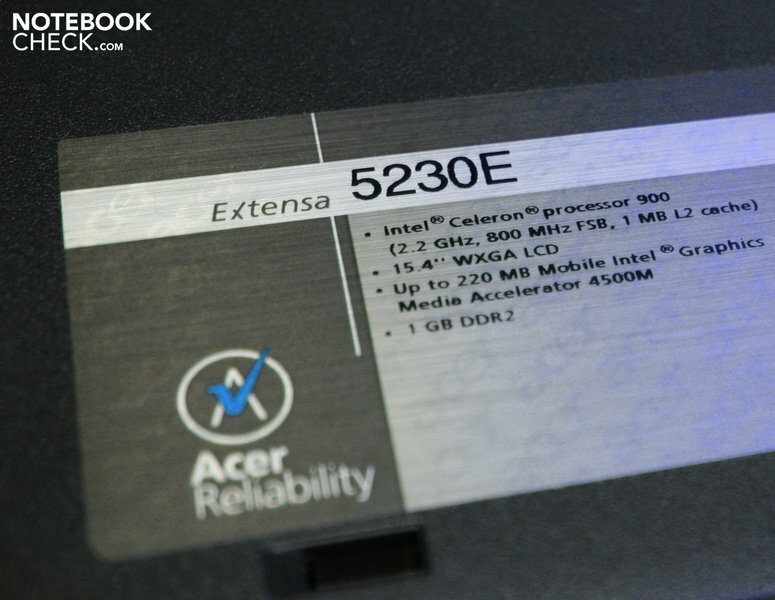 Of course you can't expect a gaming machine for 350 Euros, but for basic tasks, such as WLAN surfing or word processing, the performance reserves of the Extensa 5230E are adequate. And the one or other HD video from the internet can also be enjoyed without interruptions. Does the notebook even have a fan? We asked ourselves this questions a few times during the test: For one thing, the louver has been placed on the rear so that you have to look for it, for another the fan whispers along with an almost inaudible 29.3 dB(A), at least in an unloaded state. Even when the device is put under the maximum load, the fan noise reaches 34.5 dB(A) at most, which is still very quiet. 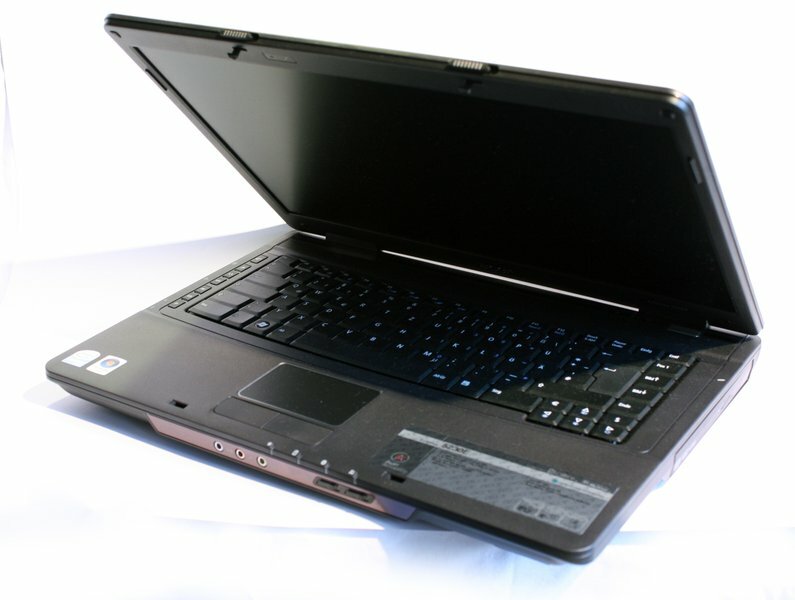 The fan noise is also shielded by the display due to its position on the laptop's rear. It's just as hard to hear the hard disk, as it also rotates with a quiet as a whisper 30.3 dB(A). The DVD drive is the "loudest", as it renders DVDs audibly with 37.3 dB(A), but this is still not unpleasant at all. Overall, the device achieves a dream result of 97% in the category of system noise - need we say more? The Extensa 5230E scores similarly good in the category temperature: The maximum temperature that we could reach in the lab was 37.4 degrees Celsius. 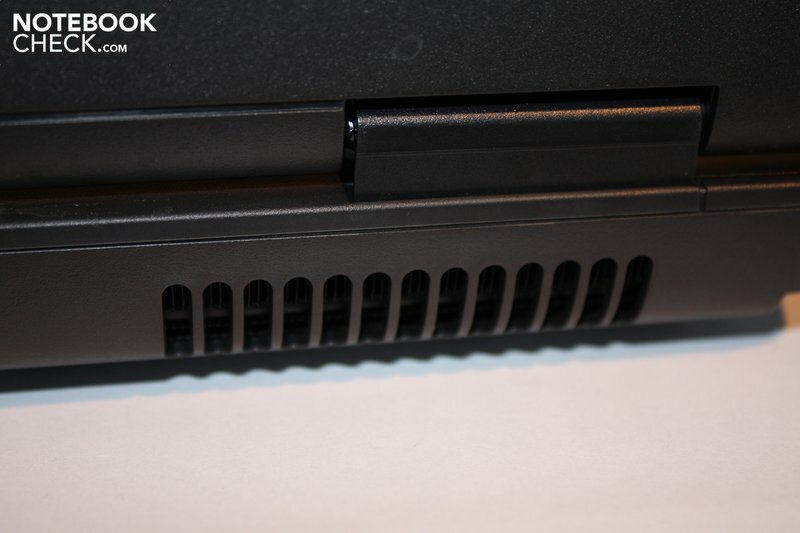 This, of course, under load and on the bottom side underneath the fan grills, where the processor is located. Therefore, those who like to use the notebook on their lap when they're on the go don't have to fear burning their thighs because the bottom only heats up minimally at most. The notebook heats up to a maximum of 35.4 degrees Celsius on the upper side that is touched much more frequently and barely gets any warmer. The adapter also didn't give cause for complaint: Even after several hours of use, it could be picked up without further ado with 43.1 degrees. The stereo loudspeakers have been placed above the keyboard in the Extensa 5230E and hidden under a plastic cover in a metal optic. The sound is thin, the trebles are strongly overemphasized and the basses are quite scanty due to the omission of a subwoofer. However, the volume is alright. The sound quality is adequate for the one or other video or a DVD. Music isn't really a pleasure, though. Audiophile persons should connect external speakers or a headphone. The 3.5mm headphone-out bids the known good sound. What stands out is a short intermission until the sound of the internal loudspeakers switch to headphones after the plug has been connected. One thing first: Sony's little 48.4 Wh battery has a bit of a hard time to really grant a long battery life. And that despite the good power consumption values: Our prototype only uses 12.2 watts when all energy saving options are enabled. But it's already 35.9 watts in maximum performance. You have to be careful if you use the preset screensaver: We've already frequently observed that these small programs that are supposed to protect the screen with moving graphics against too long freeze images can increase the power consumption quite a bit. And the energy requirement of the Extensa 5230E also surges by over 8% or almost 30% as soon as the screensaver turns itself on! It's good that the Extensa barely uses any electricity in standby or with a deactivated system: The notebook merely drains 0.1 watt out of the power line. It would naturally be even better if the notebook wouldn't use any electricity. So, just to really be sure, you will have to pull the plug every time. Despite the basically good consumption data, the fairly small battery only has mediocre battery runtimes: We could only draw out a maximum of 158 minutes from the battery in use, thus 2 hours and 38 minutes. The display brightness was set on minimum, the WLAN module disabled and the Battery Eater Pro tool read a document. Under full load, we still reached 101 minutes of runtime, which is one hour and 41 minutes. Here, the display was set on maximum brightness, the WLAN module enabled and Battery Eater endorsed a 3D graphic computation. The small difference between the maximum and minimum runtime (this is often a manifold in other systems...) indicates that the combination of battery and system components isn't optimal: The battery can't provide enough capacity to obtain a longer runtime even in energy savings mode. 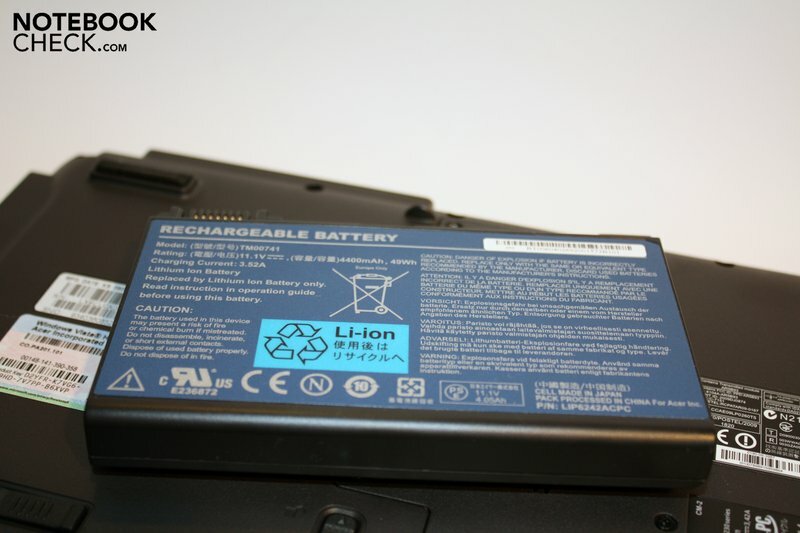 In order to get even closer to true-to-life consumption we execute tests with WLAN surfing and DVD rendering, which should advocate the notebook's consumption even more than the fairly theoretical Battery Eater tests. The results aren't very different here: 140 minutes, that is 2 hours and 20 minutes for surfing in the internet via WLAN, and the laptop only last 5 minutes longer in DVD rendering: 135 minutes equal to 2 hours and 15 minutes. This should suffice for most movies, but for movies with overlength you have to find a plug. The biggest argument for the Acer Extensa 5230E-901G16Mn is most probably the very low price of a maximum of 349 Euros, which also makes the notebook interesting for private customer who execute comparatively undemanding tasks at home. Naturally, you have to trim back expectations in view of such a low budget: Acer principally economizes on the small battery and the display where you have to accept a low resolution, a low brightness and an average illumination. The price pressure is also noticed in the omitted connections that have been veiled with unsightly plastic covers. But the value for money ratio is more than just okay in other aspects: The given application performance is solid and the manufacturing can boast with its stable case and pleasant, even if not extremely high-end, materials. The keyboard is good despite its somewhat wobbly keys and the notebook is a relief for all sensitive ears because it's so extremely quiet. Acer doesn't make any slip-ups in the temperature development and the loudspeakers are, at least for an occasional use, alright. 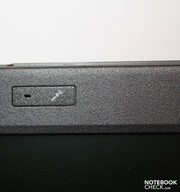 Small, nice details, such as the marking of connections on the case's upper side also add to the "good" overall impression. The Acer Extensa 5230E is basically aimed at price-wise consumers and business people. Two large hinges hold the display. 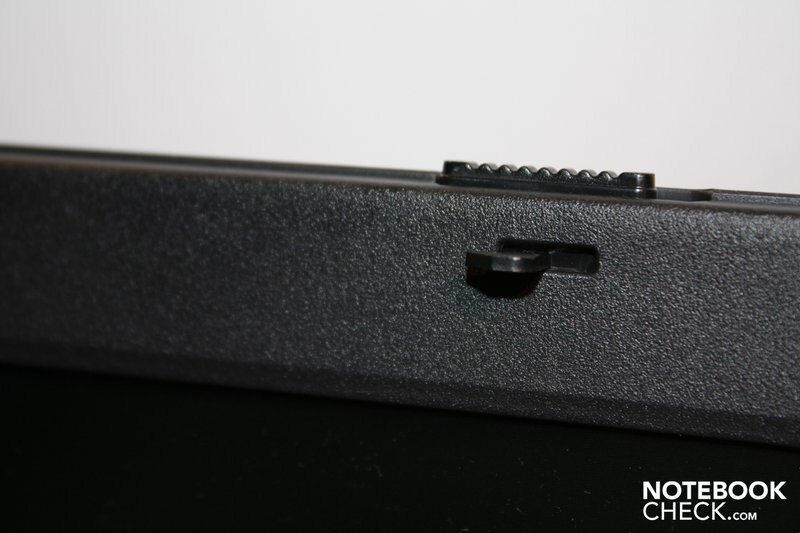 Additionally, there are two hooks to secure the display in a closed state. There is a microphone but not a webcam above the display. There is a DVD burner on the right. Unoccupied connections are simply veiled with a plastic cover. 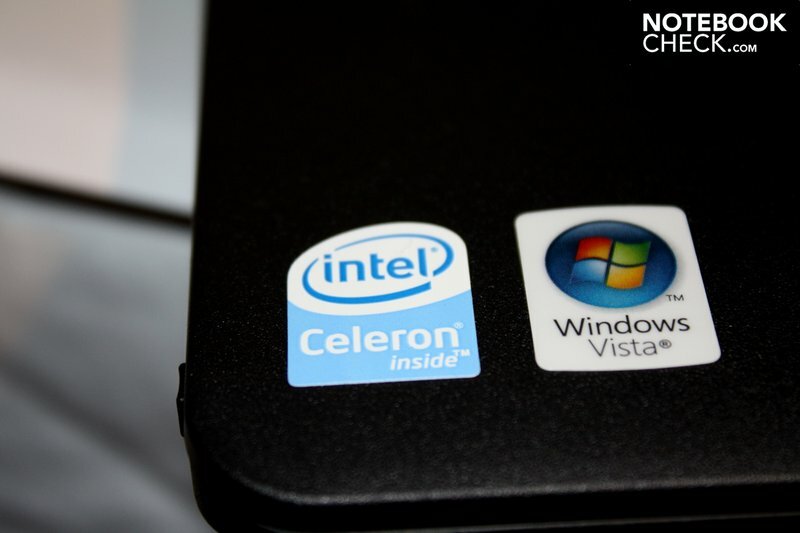 A Celeron 900 with a clock rate of 2.2 GHz does its job in the notebook. Aside from that, there is also a 160 GByte hard disk and a one GByte RAM in the system. The Celeron stays so cool that the fan located in the rear doesn't have much to do. ... and the power switch is made of the same material. 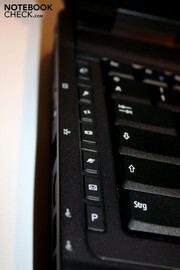 Further hot keys are placed on the keyboard's left that, for instance, start the browser or lock the computer. The case has been manufactured properly. Nothing creaks and barely anything yields. ... and it can really be written on comfortably. ... or, of course, display brightness and volume can be controlled. Those who need help with the hot keys will also find a keyboard shortcut for this. The small battery has its problems with granting good runtimes. The price is hot, but not the Extensa. We have recently tested the Lenovo G550 that however has a glossy display, the Asus UX50V could also be a competitor, especially because it looks more attractive. The Sony VGN-BZ26M only comes to question for those who want to spend 300 Euros more, but there's also more performance.